Thank you to Meijer for sending me a box of essential health products to kick-start my health, fitness, and diet goals in the new year! All opinions shared in this post are my own. Well friends, we are officially into the third week of 2016. I meant to share this post with you in the first week, but this year started off very rough for my family. It's not something that I'm ready to talk about yet, but I will be soon. So, I apologize for starting the year a couple of weeks late. Tell me, did you make any resolutions or set any goals for yourself this year? I've never been big on resolutions, since any I set seemed like things I should always be striving for anyway. So, I tend to call them goals instead. But really, I guess they're just the same thing—changes, improvements, and things I want to accomplish going forward. One foot in front of the other seemed like a good place to start recently. I'm willing to bet that weight loss, exercise, and health goals are probably among the majority of those set each year. I'm always willing to bet they're the majority of those not met come December. Today I'm teaming up with Meijer to share some products that they carry to help you meet those goals. If you're fortunate enough to live in the Michigan/Indiana/Ohio/Illinois/Wisconsin part of the country and live near a Meijer, I bet you've already seen the aisle of health, fitness, and diet products down the main aisles as you walked in to do some shopping this year. 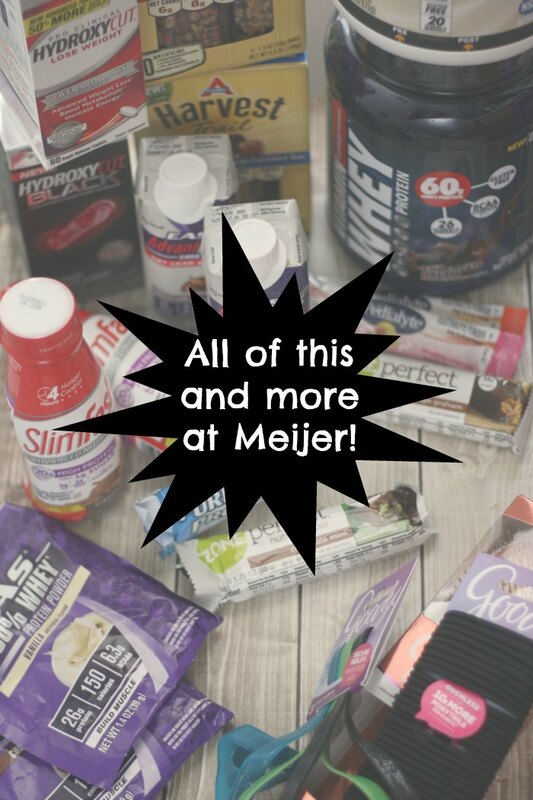 Whether your goal is maintaining, losing, or gaining weight (or mass), finding snack and meal replacement options, or working on fitness, Meijer has something for you. Aside from diet supplements, protein bars and shakes, and protein powder, you can also find yoga mats, weights, hair ties and bands, and of course clothes and shoes to exercise in. Seriously, how can one not love Meijer? I was stoked to receive a box full of products available at Meijer to help me kick start my own resolutions and goals this year. 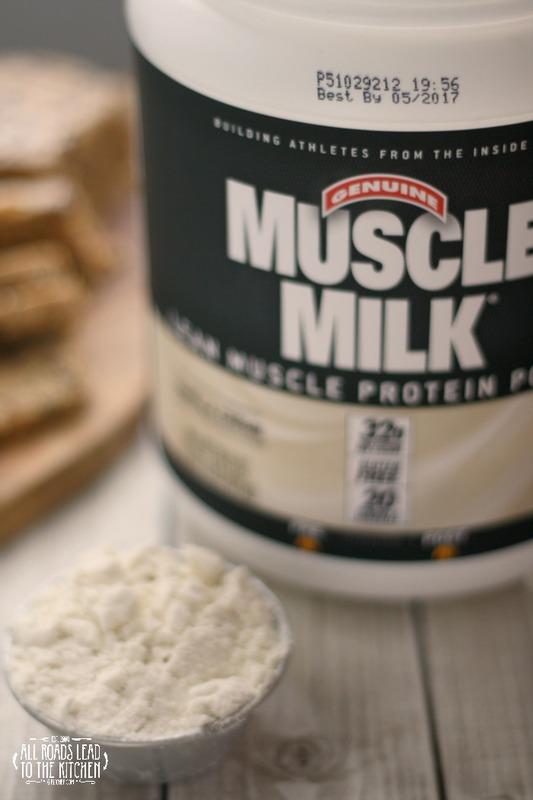 My husband (who lifts weights) and oldest son (high school athlete) already use a whey protein powder at the end of their workouts, so they were excited to try a couple of new brands and flavors. But I've never really "used" protein powder before, so I decided to do what I do best and incorporate some into food. 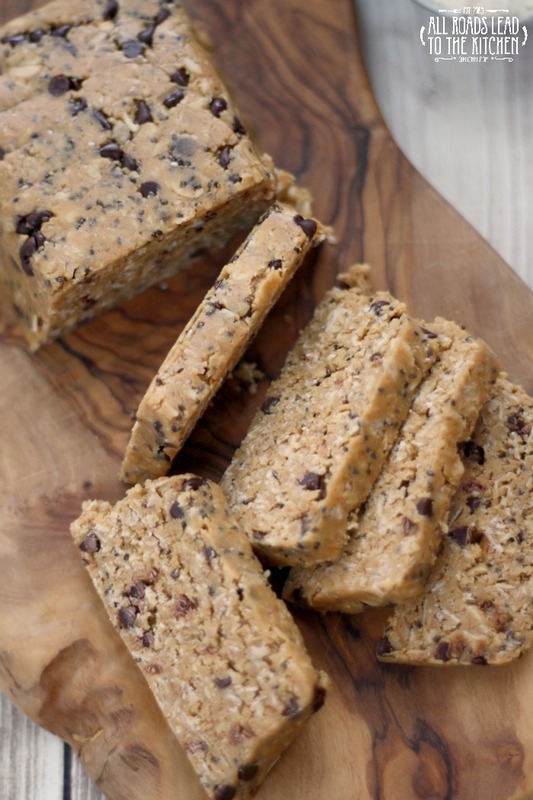 These homemade protein bars are so simple that absolutely anybody can make them. While Meijer does stock all sorts of protein bars, I'm more likely to buy a canister of protein powder and make my own on a more regular basis. I mean, you can make a heck of a lot of protein bars from one of these containers! 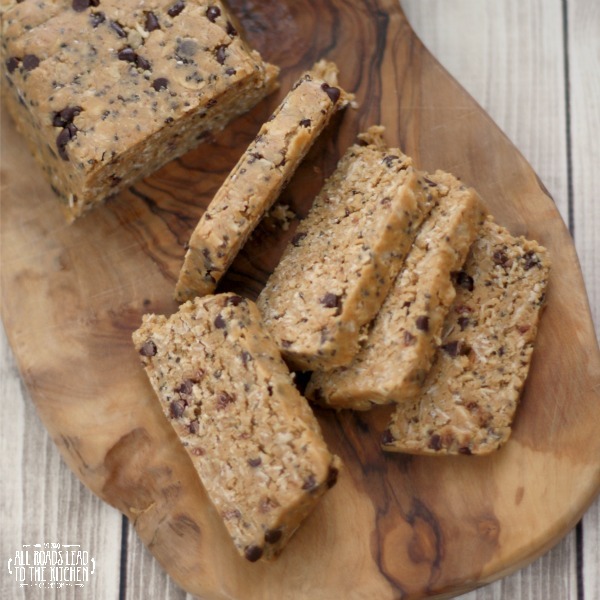 They don't require any baking, but you will need to make them the day before you want to eat them, as they need to be refrigerated for at least 12 hours before slicing them into individual bars. You could leave the mini chocolate chips out if they're not your thing; chopped nuts and/or chopped dried fruit would make a great substitute. 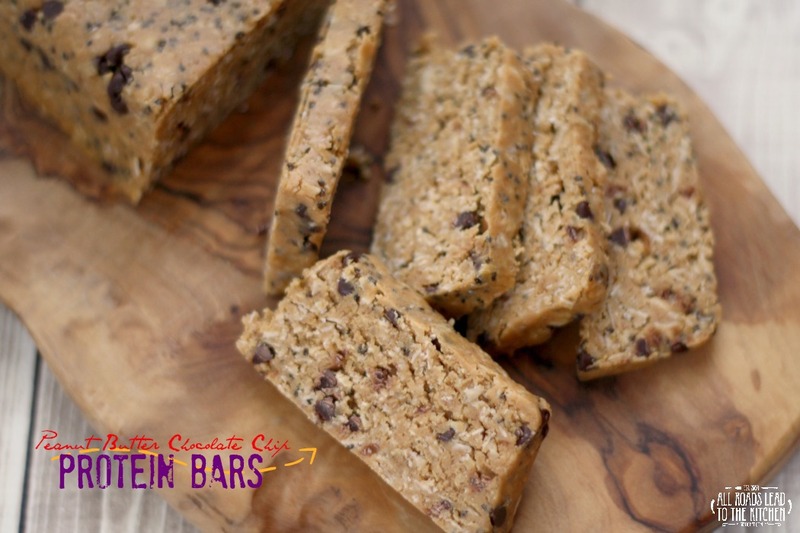 Squash those cravings with these simple, delicious no-bake peanut butter protein bars loaded with oats, mini chocolate chips, and chia seeds. Combine oats, protein powder, and ground almonds in a bowl and toss to combine. Add peanut butter, almond milk, and barley malt extract and stir until everything is well-combined. Add mini chocolate chips and chia seeds and stir until they are both evenly distributed and you have a dough (that looks like cookie dough). Line a mini loaf pan (approx. 2" x 5 1/2") with an overhang of parchment or wax paper, or plastic wrap. Put all of the dough into the lined pan and press down until packed and even. Use the overhang to cover the top of the dough and refrigerate for at least 12 hours. Lift the parchment (or whatever you used) out of the pan and slice the loaf into 12 slices/bars. Wrap loaf already sliced into bars (or wrap individually or separated by sheets of parchment or wax paper for an easy grab-and-go option) and store in a zippered baggie or airtight container in the fridge. Did you make any resolutions or set any goals this year? Do you have any tried and trusted products for helping you achieve them if they are diet, health, or fitness related?